Can You Put Wood Trim Around a Gas Fireplace? Gas fireplaces have the versatility of being purely decorative or adding charm to the room as well as providing a heat source. They can be set to display realistic flames with no heat or adjusted to add warmth to the room with radiant doors and fans. At either setting, the heat is not intense enough to pose a fire danger, so you can safely install wood trim around a gas-powered fireplace. Modern wood trim is sleek and angular, with defined lines and corners. For more formal settings such as home libraries, studies, dens or formal dining rooms, arched wood trim around the fireplace adds elegance to the decor. If the fireplace is in a bedroom, choose wood trim with soft, flowing lines to add an air of coziness to the room. Dark cherry or oak trim gives a fireplace a conventional style that complements Early American furniture and accessories. 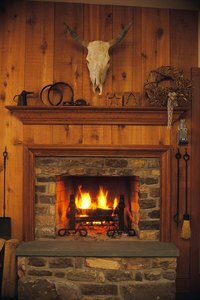 Pine trim adds a rustic touch to the fireplace, especially if it has some knots in it, and it goes well with homes decorated with country-style furniture and themes. The light natural colors of birch, ash and poplar fireplace trim pair well with modern architecture and materials such as metal and glass. You can stain all types of wood trim to match window moldings, furniture or other wood in rooms. Wood trim can accent other decorative fireplace materials. Hang a sheet of embossed stainless steel above the fireplace, and trim the edges with thin wood molding. Hand-hammered copper panels on either side of the fireplace coordinate well with wood mantels and trim. An oversized mirror framed with wood that matches window trim or furniture makes the fireplace the focal point of the room. Accent stone or brick fireplaces with wood planks above, below or on either side of the stone or brick. If the fireplace has glass doors on the enclosure, install a thin wood trim around the metal frame of the enclosure to add contrast and texture to the area. What Are the Dangers of Sitting in Front of a Fireplace?